Magnolia tells a complex and layered story of the lives of people who live in America that prove to be more interrelated with each other than what we expected in the beginning. We see the protagonists changing through various events and after the revelation of hidden truths. When I realized this movie is approximately three hours I was terrified because I do not tend to watch such long ones, though I cannot say I felt bored or tired. 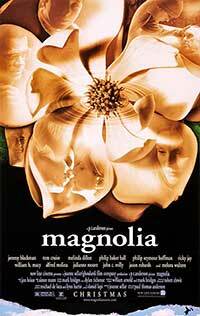 Only after the two-hour duration did I start to feel Magnolia slow down abruptly, and that was a little disheartening because in the beginning it had a quick plotline. However, I cannot say I consider it a big deal. At the start, the viewer feels a little puzzled trying to understand and decipher what is going on in each story and to find a way to link the new information together, but as the movie gradually unravels, (s)he combines them together and everything becomes even more intriguing. Generally, I found it very interesting how realistic everything was presented without being superficial. There are many everyday situations in Magnolia and I was surprised to realize how much ahead of its time was. It is considered an old film or a “classic”, since it is almost twenty-years-old now, though it could describe situations of the current era. I just found it a little strange that we have two different characters in the movie inflicted by cancer, maybe they could have thought of a different illness for the other one. Then I thought there was a possibility that was done deliberately, since in that era there was a rise in the percentage of people dying from cancer, still I found this part a bit unusual. I also enjoyed the contrast between the relationship of Linda (Julianne Moore), a younger woman who is married to the elderly, wealthy, and fatally ill Earl (Jason Robards) — which seems to be based on lies — and an upcoming relationship between addict Claudia (Melora Walters) and the hapless police officer Jim (John C. Reilly) with a more optimistic tone. 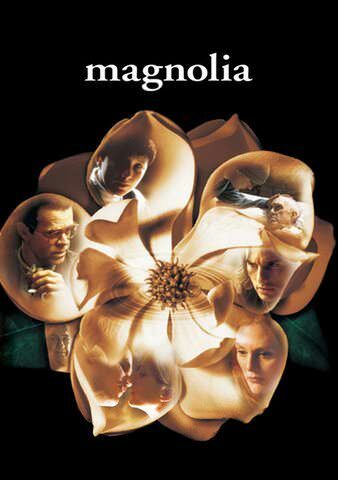 In terms of direction Magnolia was well handled by Paul Thomas Anderson and it did not disappoint in those scenes focused on Tom Cruise, where Anderson’s command of the film can be seen most prominently. One of my favorite scenes is when Frank (Tom Cruise) is interviewed by a reporter and starts looking at her with that passive aggressive face when his lies are revealed. Cruise’s performance is powerful in these scenes. Although I feel everyone gave a great performance, those of Tom Cruise, Julianne Moore and Philip Baker Hall are the standouts. Cinematography was beautifully done with the use of blue color tone a prominent feature, and the infamous frog scene, which was great. Although I think it was artistic, I doubt it a lot and that has to do with what the director was thinking when he came up with it. Anderson had stated that later an acquaintance of his told him about the role of the frog in Christianity. I feel like he added that scene to make us laugh after all these minutes that we feel melancholic or just unnerved. Still, I liked the ending of the movie, I found it optimistic and liberating, something in contrast to the pessimistic opening — the characters must now face the consequences of reality and try to become better. A complex mosaic of interrelated characters' stories intertwine through stories of love, loss, substance abuse and a search for meaning in this Golden Globe-winning (Best Performance by an Actor in a Supporting Role in a Motion Picture Tom Cruise) classic from writer/director Paul Thomas Anderson.